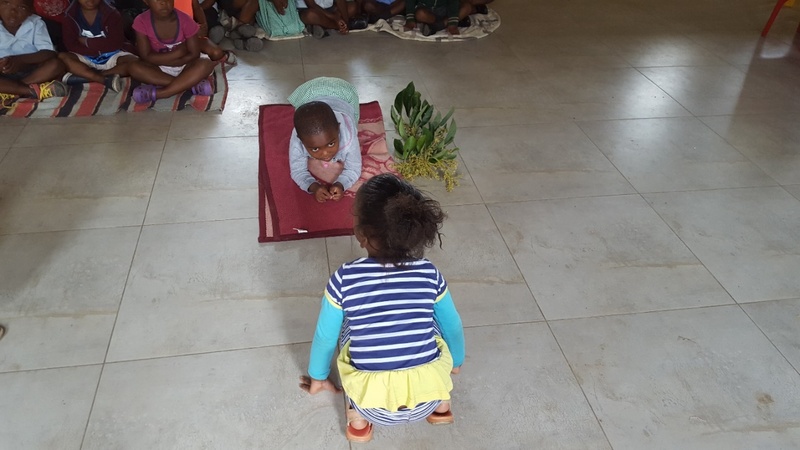 Dramatising a values story in a Values Education class (Inhlangano Yeziwe Day Care Centre, Folweni) during evaluation. Clearly, the project has shown significant growth and development. Evidence of this range from the phenomenal increase in numbers trained, the number of children brought ‘under the umbrella’ of values, the spatial spread covering five areas and including both urban and rural to the ongoing addition of relevant partnerships and networks. The next phase of the ECD VEP, critical to consolidating the gains made thus far and safeguarding sustainability, is the development and implementation of a parent enrichment programme to reinforce the values ethic in the home and to assemble a core group of trainers drawn from Phases 1, 2 & 3 for community ECD VEP roll outs. While the best chance of developing caring and socially responsible citizens is starting in the earliest years of a child’s life, it must also be said that central to achieving this long-term objective must be our commitment to be credible role models for children to mimic. “Nomandla and I undertook visits to two of our community training centres. Our expectations were far exceeded in the training sessions (Umlazi and Hammarsdale) as we saw not only the commitment and work ethic of the trainers with the fully absorbed trainees as they engaged with the values but, more significantly, we felt the palpable enthusiasm in the class! They are all there of their own volition, learning about values and the application thereof and thoroughly enjoying the whole experience – how amazing is that!!! The real story, however, concerns another of our trainers in Kwa Makutha who we visited on our way back. While chatting with her about the progress of her training, she told me that, for her, the best outcome of the values training has been in the Umbumbulu ECD Association of which she is the chairperson. Fifty of her values education trainees are site supervisors drawn from the association. Prior to the values training, the members were tearing themselves apart with typical infighting, destructive gossip and general discontent, to the extent that she was seriously considering relinquishing her position.